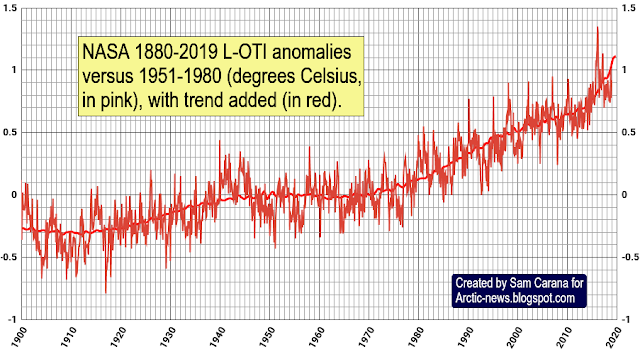 Above image confirms an earlier analysis that it was 1.73°C (or 3.11°F) warmer than preindustrial in 2018. The image also shows that it could become 1.85°C (or 3.33°F) warmer in 2019. 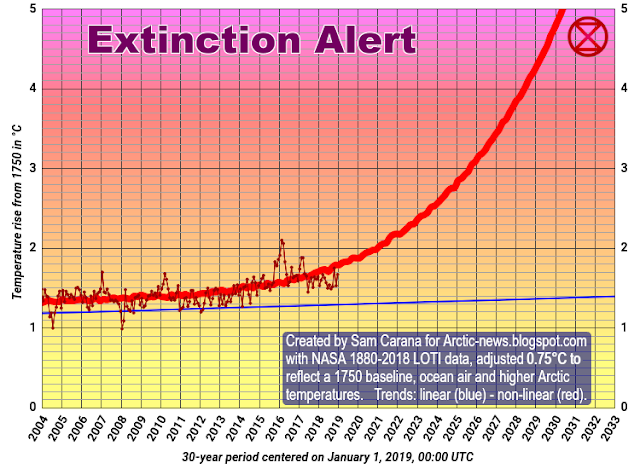 This according to the non-linear trend (red line) that follows from the data and also follows the data better than the blue linear trend, which also follows from the data, but is out of line with the recent temperature rise. Data are adjusted for a number of reasons. The first reason is a baseline issue. At the Paris Agreement, nations pledged to ensure that the temperature rise would not cross 1.5°C above preindustrial. Accordingly, data should reflect a 1750 baseline. The default baseline for the NASA Land+Ocean Temperature index (L-OTI) is 1951-1980. The above image features two maps, one showing the 2018 temperature rise compared to 1951-1980 (left) and another map showing the 2018 temperature rise compared to 1885-1915 (right). The difference is 0.25°C. 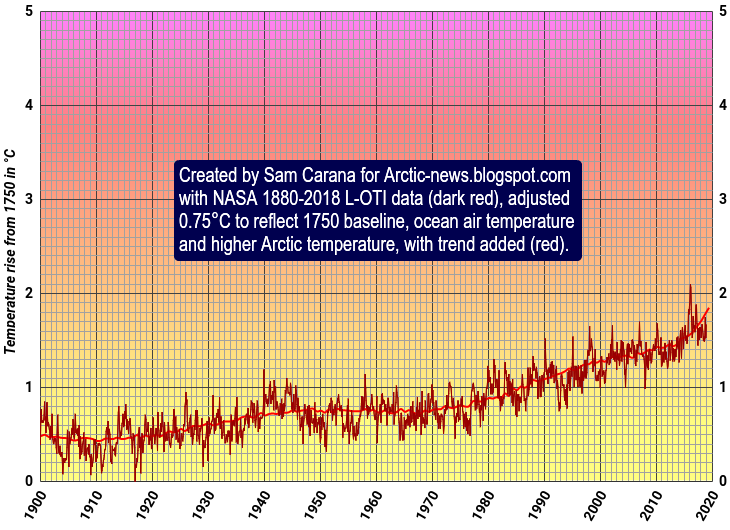 In other words, using 1900 as a baseline would require a 0.25°C adjustment. That figure of 0.25°C is conservative, firstly because 2018 was a La Niña year. Furthermore, as above image illustrates, the period from 1900 to 1920 was almost 0.3°C below 1951-1980. Anyway, this conservative figure of 0.25°C is used in this analysis. Additional adjustment of the data is needed, in order to reflect a 1750 baseline. The total baseline adjustment could add up to as much as 0.55°C, as discussed in an earlier post. Furthermore, the large grey area in the Arctic on above map on the right reflects a lack of measurements in the Arctic that go back to 1900. Simply excluding those data would downplay the temperature rise, since temperatures have been rising faster in the Arctic than in the rest of the world. An additional adjustment of 0.1°C therefore seems appropriate. Finally, NASA L-OTI data are for air temperatures over land and for sea surface water temperatures for oceans. To get an idea how much the temperature of the atmosphere has risen close to the surface, it makes more sense to use air surface temperature over oceans, rather than sea surface water temperatures, resulting in another additional adjustment of 0.1°C. The total adjustment adds up to 0.75°C, resulting in the graph below. The final step in this analysis is a projection into the future. In the image at the top, the trend is extended to the year 2033, but the vertical axis doesn't go beyond 5°C warming. Why 5°C? A recent study looked at plant temperature tolerances and concluded that extinction will already occur far earlier than when upper tolerance levels were reached for individual species, since "loss of one species can make more species disappear (a process known as ‘co-extinction’), and possibly bring entire systems to an unexpected, sudden regime shift, or even total collapse. There was a small group of species with large tolerance limits and remarkable resistance to environmental change, but even they could not survive co-extinctions. In fact, their extinction was abrupt and happened far from their tolerance limits and close to global biodiversity collapse at around 5°C of heating." Importantly, the image at the top doesn't even depict the worst-case scenario, in the sense that the non-linear trend merely follows from the data, i.e. 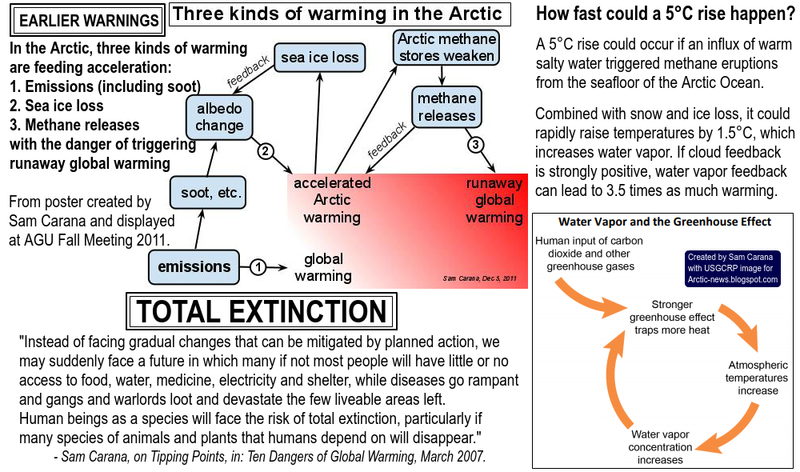 it doesn't take into account tipping points such as abrupt disappearance of the Arctic sea ice or sudden eruptions of methane from the seafloor of the Arctic Ocean.